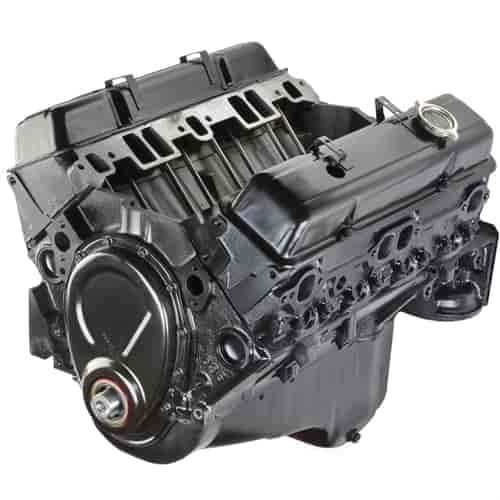 This universal 350 engine uses a brand new block and can be a replacement in most 1973-85 GM vehicles and retrofitted into virtually any vehicle. At a base horsepower of 195, the engine can produce up to 260 HP and 350 ft/lbs torque with a 4-bbl carburetor and headers. The engine is covered by a GM warranty for three years or 100,000 miles in applicable GM vehicles only. JEGS has the GM Goodwrench Chevy 350 for sale at a great price! 12681429 is rated 4.6 out of 5 by 47. Rated 5 out of 5 by Reuben Reubenl from Not bad I bought this motor a few weeks ago and it's nice for my 87 GMC Sierra classic. The only thing different I would of liked is if there was a color option instead of black. Rated 5 out of 5 by AZRick from Good pick I bought and installed the engine about a month ago. Fired up immediately and idled perfectly . Engine is running great with a solid sound and good power response. I have no complaints. My only concern when ordering the engine was a lack of any warranty should it fail in the future. GM will only warranty if they install it at their dealerships. I confirmed this via my local dealership when I called. Rated 5 out of 5 by Melcaswell from Fast shipping I ordered on the Black Friday sale, Monday the trucking company called, said they would deliver the next day. Tuesday the truck rolled up, and I had my crate engine sitting in my garage. Don't have it running yet but it's going together as it should. Chevrolet could have sent better instructions, Google is your friend. Rated 5 out of 5 by Blazer Chalet 76 from Chevy Motor and Jegs Bought the motor for 1976 Blazer K5 Chalet. Bought with the carb , distributor , and intake and valve covers. Arrived very quickly 3 days. The install went smoothly. Fired right up and broke in the cam as described in the instructions. Have 150 miles on it now and very impressed with the product. Great power and low end torque. Changed oil at 100 miles and am ready for a road trip to go deer hunting. This is a great product and the Jegs Tech adviser answered all my questions prior to purchase. This motor has the 260 HP easily. I think its probably closer to 285 the way it is set up with the headers. The Jegs company will get my business from here on out on products they sell. Gret product great price and a great buying experience. Rated 5 out of 5 by Deuce Deficit Disorder from Best Buy for the Money I built 1932 Fords, I have bought 7 or 8 of the Crate 350 Chevrolet engines from Jegs. I have never had a problem with any of them. They start up and run extremely well, no oil leaks, great oil pressure. I install 3 deuce carb. intake for that hot rod look. It don't get any better than that. What a great way to put a hot rod together. You better believe that I would recommend a great deal like this to anyone. Rated 5 out of 5 by wwilson from great motor Great dependable motor with good warranty and great price. Looking to do an R&amp;R with my 1989 firebird formula 350. I'm just wondering if it would be a simple pull out, bolt on the accessory components on this engine, and put the new one in without having to buy an extra kit or anything. Are there any suggestions? Camshaft specs for this engine shown as 194/202 duration &amp; .383&quot;/.401&quot; lift however, these specs do not match anything in the list of factory camshafts. I was wondering if this was a typo or if you can provide a part number for this cam. These are the correct specifications for the cam. GM created this cam for this crate engine. Does jegs provide a list of parts recommendations for the major parts not included with this engine? What is the optimal cruising RPM of this engine? This will vary with the other components being used, but 2000 rpm will work. Does the 12681429K kit work with this block? Yes, this installation kit will work perfectly with the crate engine. What is the recommended oil for this engine? I live in Florida. 90+ degrees 8 months of the year. Yes, this will fit the 1960 Chevy Corvette. will the fit a 2007 impala ss if not can you direct me to 1 thats does thanks.